Another big time talent out at our Barton Elite QB session was northwest great, Jake Heaps (6-2 210) formerly of Skyline HS, and currently at the University of Kansas with Charlie Weis and company. Much like Max Browne, Isaac Dotson, and Jeff Lindquist you are not going to find a much better character kid. There is no lip service when we say that all of these kids are quality people first and top quarterbacks second. Something Taylor Barton demands if he is going to work with you is that you conduct yourself the right way on and off the field. If you don’t he doesn’t care how good you are, he will not train you. All of the athletes mentioned above have a strong family support system so that has been a positive, but what makes these fierce competitors as good as they are is something we talked to Heaps about. Jake started as a true freshman at BYU and set some freshman records, but things didn’t quite work out. 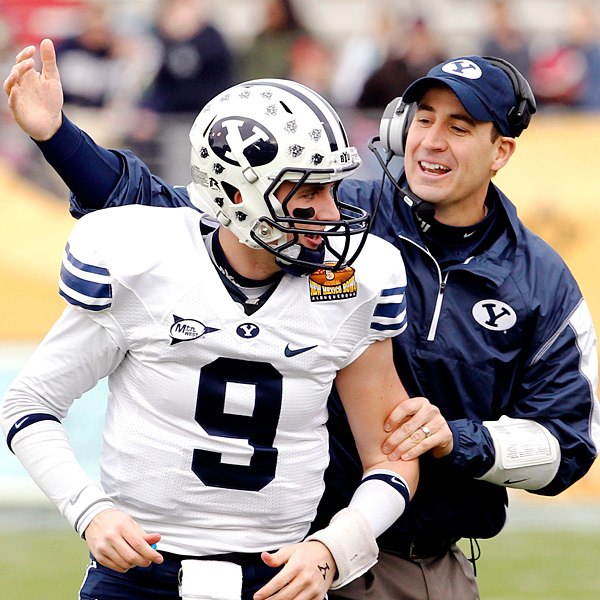 Heaps has plenty of positives to mention when referencing BYU, but things don’t always goes as planned and that’s okay. Heaps now has teamed with the Offensive juggernaut Weis, to bring back some of that intensity that he has been looking for. " He’s an intense guy that makes you work to get better day in and day out" Jake says. He will redshirt this season and then vie for the starting job, his junior and senior season. His senior year at Skyline Heaps was rated the #1 QB in the country, after throwing for 43 Tds and only 4 Ints and winning the class 4a state title. Take a listen to what Jake has to say about being back home and training with the top QB coach in the country Taylor Barton. More then anything they are good friends much like Browne, but the trainee always comes away from their training sessions feeling better about his game, and the little things that needed some fine tuning. Heaps says, " Taylor is able to see stuff that others can’t, and he never lets me get away with something being 90%". He continued, "If something is wrong we work on it until its fixed, its that simple". I can’t say enough good things about Jake, other then the fact that my hands are still regaining feeling from catching his laser passes less then a week ago. We wish Jake nothing but continued success, enjoy the video interview.